“I can’t do it...Don’t ask me!” Lan’s on a steep learning curve as he sets out to save the Balance of All That Is. Lan's simple life with his adopted grandmother, Boosha, is shattered in an instant as she sends him running into the Forest of Dandaka to escape The Gatherers, a group of child abductors. Sent by the evil overlord, Draegan, they are on a mission to capture all Crystallines, the children with distinctive blue eyes and special gifts. But why are they after him? Lan's eyes are just a normal brown. In fact, other than being an orphan, everything about him is normal and he wants to stay that way. Now he must make his way through the vast Forest using just a strange Map Compass, a few tools and his own skills to survive. Before he can return he must deliver the 3 Keys and the Crystal Cube called Empowerment to a village on the other side of the forest. The only problem is that Lan doesn't have the 3 Keys. Thinking only of going as fast as he can and returning to his beloved Boosha, Lan tries to cheat the Map Compass only to learn that sometimes the shortest route is the one that appears longer. Before his journey is over, Lan must master the secrets of the trees, meet a strange hermit who knows his past and discover his gifts as a leader. Will he ever return to Boosha? Set in a post apocalyptic world, this YA Coming of Age fantasy explores the question "What would the world look like if the poles had flipped in 2012?" 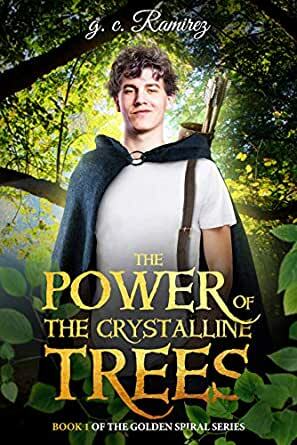 I finished The Power of Crystalline Trees and handed it immediately to my 10-year old daughter who is now reading it voraciously. The characters are relatable for both young and old. An interesting twist on the classic reluctant hero's journey with magical trees, a hero who learns from nature, and a heroine who befriends animals (and cares for them far more than the humans around her). Woven throughout is the idea that individuals are empowered merely by knowing who they are at their very core and trusting that the natural world is working with them and not against them. A lovely message for our trying times. Though I look forward to the next book, I feel satisfied that the end of this one came to a good close with no frustrating cliffhangers...providing me a good read and an eagerness for more soon. In her premier fantasy novel Ramirez sets herself up as a new writer of interest. Her free-flowing style plays a pied piper enchantment drawing you into the magical and mystical world of the Crystallines. Book one of the Golden Spiral series is a delightful and inspiring tale set in the time after the great earth shift. In this society anyone with blue eyes or any beyond-normal abilities is shunned, immediately reported to the Gatherers, hunted down and taken away. Most villagers fear the Crystallines. To harbor one, even unknowingly, invites destruction to the entire village. The heart of Book One takes Lan on an incredible journey through the forbidden forest. This journey, fraught with a myriad of challenges, changes him, and offers to change the reader as well, piping you on and into the magical and mystical world of Crystaline Energy. as the Guardians persue them. Escaping to the forest, Lan and Asira make a pact and reluctantly agree to travel together. Lan needs to follow the new direction of the compass directing him to Laird and the Ausangate mountains. Asira only agrees to accompany him if Lan promises to help her find her parents first. "Agreed", says Lan, sealing the pact with a handshake. Thus ends Book One, leaving the reader eagerly anticipating Book Two. This is an amazing and gripping read! The main theme of Transformation is universal for all ages. The imagery is definitely bound to keep kids thoroughly engaged! The challenges faced by the characters, Asira and Lan are easily relatable to anyone on a journey of waking up to oneself and finding their hidden gifts. Both enchanting, magical and mythical yet firmly grounded in wisdom! I so loved the Tree symbolism! The idea of Growth as well as Sustenance and nurturing that this inspired within me. 5.0 out of 5 starsWhat a page turner! This is one of those books that you have a hard time putting down. I was immediately immersed in Lan's world and his epic quest to save the world. The characters jumped off the pages and I love how she wove in the magical trees and animal allies. This first book is full of adventure, mystery, and is an empowering tale of Lan and his friends discovering who they really are and what they are meant to do together. I can't wait to read book 2!! 5.0 out of 5 starsI had to pull myself away from reading!